I fell in love with Todd Parr’s book at a department store. Of all the places :). Since then, I have been buying or borrowing Todd’s books from the library and reading them with my kids who share my love for Todd’s books. Todd’s books have simple, yet complex messages, are beautifully illustrated, and are interesting for all the young at heart. The first time I connected with Todd Parr was last year after we discovered his books and couldn’t put them down. 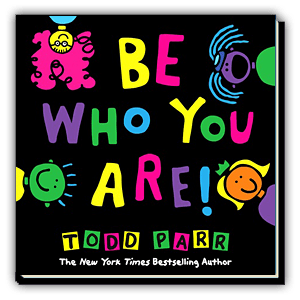 I held a giveaway with Todd’s books right after and because the giveaway was very well received, I decided to do another one, with Todd’s newest book: Be Who You Are. Both my kids devour Todd’s books from cover to cover and when my 7-year old son is in a good mood and has loving feelings for his sister, he even reads the books to her. Otherwise, she stares at each picture carefully and comes up with her own stories about what happens in the book. 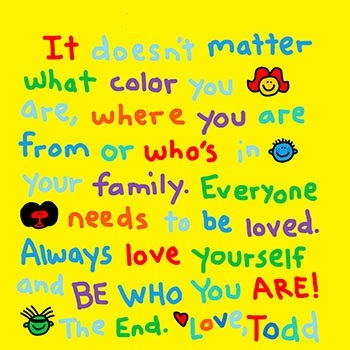 Be Who You Are is a gorgeous book (like all Todd’s books) with a beautiful message. It helps kids understand that although we are all different from one another, we need to be true to ourselves, be kind with one another and not judge a book by its cover. I contacted Todd prior to this giveaway and asked him a few questions to get to know him better. He happily agreed. So without further ado, here’s Todd. When did you write your first book and what was it about? 1998 There were four 6×6 books published. The Oaky Book, This is My Hair, Do’s and Don’ts, Things That Make You Feel Good. I think I am over forty five now. One of my favorites is The Underwear Book. It’s always a big hit with the crowd. I’m also very proud of The Goodbye Book as that took me a long time to figure out how I was going to tackle the issue of saying goodbye to someone. Each of your books carries beautiful messages and your newest book is no exception. The book is entitled “Be who you are”. Tell us what the title means to you. Thank you. Be Who You Are is an extension of my book It’s Okay to Be Different. Sixteen years this was my message for my readers. Now, I just want to empower my audience to BE WHO YOU ARE. What does your schedule look like when you are creating? When you begin writing a book, do you have a picture in your mind for each page or do they slowly come to you as you progress through your creative process? How long does it take to create a book, from start to finish? Usually once I have the idea I just start drawing, and things quickly unfold. I get excited so I want to know that my publisher is excited as I am. The entire process is usually a year or more. I like to cook. I also love to be at the ocean. Do your readers get in touch with you? What are some of the messages you receive? Yes! So many people express how my books have helped them, or someone in their family. What book do you have on your night stand right now? I’m being honest so I will tell you it’s my iPone and Watch charging. And a picture of my dog Bully. But when I was young it was Go Dog Go by Dr. Seuss. And of course, I have to ask a food-related question. Do you like to try new foods? If you do, what was the last one you tried and what did you think of it? Thank you, Todd, for being part of this giveaway and thank you for enriching our children’s lives with your books’ positive messages that build self-esteem and help our little ones grow into awesome human beings! I am certain you’ll love Todd’s books as much as my family does and I hope you’ll read and enjoy them with your entire family. 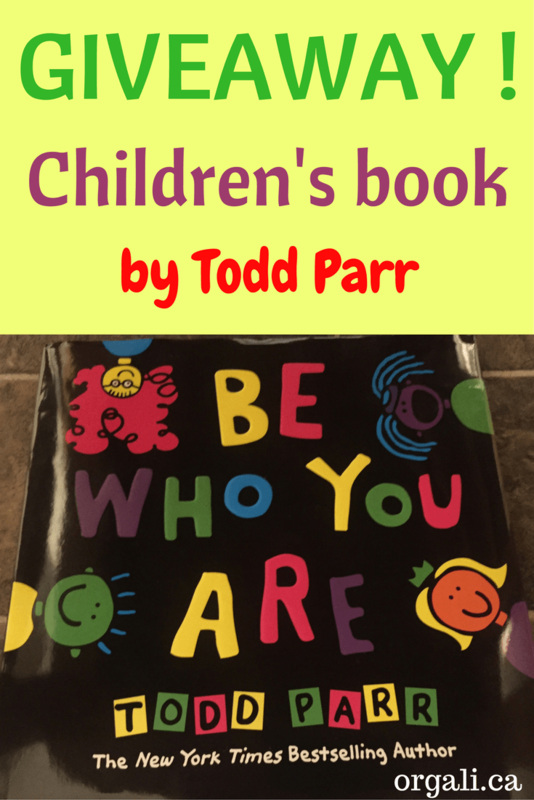 There are the 3 ways to enter this giveaway for “Be Who You Are” by Todd Parr. Each gives you 1 entry to the giveaway. Subscribe to the Orgali blog by email. The link to subscribe (green rectangle) is on the right side on this page. Tell us in the comments section below if your family read Todd’s books before and if you have a favourite. The giveaway for Be Who You Are starts on Sunday, January 22, 2017 and ends on Sunday, February 5, 2017 at 8 pm MT. A winner will be chosen using a random number generator and announced on the blog on Monday February 6. The odds of winning depend on the number of entries received. I will contact the winner by email and post the result on the blog. The winner will have 48 hours to respond. If no response is received within 48 hours, another winner will be chosen. The winner is Renee Hribar. Congratulations, Renee! I may have seen his books before. I don’t think we have read any of them yet. Love, Love, Love his books! Such beautiful messages. My daughter knows them all by heart! Sharing everywhere! My 2 kids & I are a huge fan of Todd’s! We follow him on Twitter & Instagram! We have a huge collection of his books, and are constantly urging our 1 room small town library to get more! My son (7 yrs old) loves “The Mommy Book”, he loves comparing the Mom with the huge hair to me! My daughter (3 yrs) loves “The Underwear Book” it helped us get into potty training and has just been an favorite since. My Mom does Daycare in her home, where I read my 1st Todd Parr book, “The Okay Book”, it’s definitely a family thing! We have to get any new books that come out now! Such huge fanselection! We ❤ you FB too. I don’t have kids but I think that children’s books also have meaning for adults and sometime speak with a simplicity that allows we older folks to recognize some essential truths that was miss with more adult “talk”. I haven’t read any books of Todd’s yet but will certainly look for them. I have never heard about these books but it sounds like an author I should check out! Thanks for sharing. I’m a huge fan of Todd Parr. His work is inspirational for young readers. We haven’t read any, but this looks wonderful! We haven’t read these yet! We have not read these books yet, but would like to. We haven’t read any of Todd’s books before, but I’m looking forward to reading this one. I have never seen any of these books but I would love them for my Chloe Pearl! I followed you on Facebook as Nicole Lancaster. My family has not read any of Todd’s books. I think my family would really enjoy them. I Subscribe to the Orgali blog by email. Our favorite Todd Parr book is the Daddy Book. I love this interview and cannot wait to try these books in our home. Thank you Alina for introducing me to them! No I have not read his books before, but I should have! ..I have also liked Orgali Holistic Nutrition. Subscribed to newsletter, liked Facebook page and no we haven’t ever read any of his books! My son has It’s Okay To Be Different! It’s the only Todd Parr Book I have ever read but we LOVE IT! It’s definitely one of his go to books before bedtime! Our family hasn’t yet read Todd’s books before. Our son is just about ready for them now. I know of Todd Parr’s art but not his books. I have a toddler who loves to look at books. I have never heard of this author, but his books look very inspiring. Hopefully, we can add some to our bookshelves soon. Also, I’ve tried to “Like” your page on Facebook, but unfortunately FB is being difficult this morning & will not allow me to do so… However, I was able to “Follow” your page! Hopefully this will work?! My FB name is Amanda Stovall… Thanks again! And, I don’t believe we have ever read any of Todd Parr’s books, but after reading your article I am really interested in getting them! Thanks so much for sharing about this author! All children need books such as these that teach such important lessons & that help them with self-esteem! love this blog! You have some great things here! I’ve never read any of his books before, but they sound wonderful! Great explanation of the books theme. How exciting that you got to reach out and speak with the author. Thanks for sharing! I have never heard of his books, but my kids love to read and I think they would adore this! Love the bright, vibrant illustrations in these books! So fun for kids! I have never read any of his books before, but after reading your interview and info about this book I think I will have to check him out! I have not read any of his books but now I’d like to. I subscribed to the Orgali blog by email. I Like Orgali Holistic Nutrition Facebook page. We have not read Todd’s books before but we would love to. Love to read to the grandkids. We have never read his books before. We havent read any of Todd’s books yet, but after reading your great review, I’m putting him on our list! We have not ever read any of Todd’s books yet, but would absolutely love to! I subscribed to emails! Same email as below. I followed on facebook as Lisa Coomer Queen. We haven’t read these books yet. They look awesome! My grandchildren would like these. Thanks! We have not read any of Todd Parr’s books yet, but they look like fun reads. We haven’t read any of his books before.